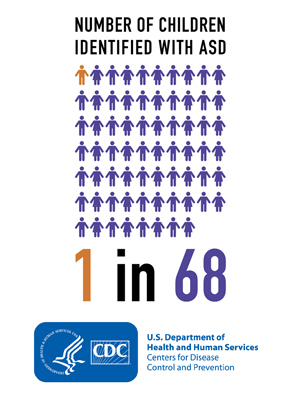 Explore the similarities between phytocannabinoids and endocannabinoids, as well as any potential practical applications cannabinoids might provide for treatment of ASD in the next article in this series. There are 60 references in this article. Click here to view them all. Alger, Bradley. "Getting High on the Endocannabinoid System." Cerebrum (2013). Andó, Rómeó D., et al. "The inhibitory action of exo-and endocannabinoids on [3H] GABA release are mediated by both CB1 and CB2 receptors in the mouse hippocampus." Neurochemistry International 60.2 (2012): 145-152. Aso, Ester, et al. "Lack of CB1 receptor activity impairs serotonergic negative feedback." Journal of neurochemistry 109.3 (2009): 935-944. Benito, C., et al. "Cannabinoid CB2 receptors in human brain inflammation." British journal of pharmacology 153.2 (2008): 277-285. Best, Aaron R., and Wade G. Regehr. "Serotonin evokes endocannabinoid release and retrogradely suppresses excitatory synapses." The Journal of Neuroscience 28.25 (2008): 6508-6515. Bolognini, D., et al. "Cannabidiolic acid prevents vomiting in Suncus murinus and nausea‐induced behaviour in rats by enhancing 5‐HT1A receptor activation." British journal of pharmacology 168.6 (2013): 1456-1470. Booz, George W. "Cannabidiol as an emergent therapeutic strategy for lessening the impact of inflammation on oxidative stress." Free Radical Biology and Medicine 51.5 (2011): 1054-1061. Braida, Daniela, et al. "5-HT1A receptors are involved in the anxiolytic effect of ∆9-tetrahydrocannabinol and AM 404, the anandamide transport inhibitor, in Sprague–Dawley rats." European journal of pharmacology 555.2 (2007): 156-163. Carey, Megan R., et al. "Presynaptic CB1 receptors regulate synaptic plasticity at cerebellar parallel fiber synapses." Journal of neurophysiology 105.2 (2011): 958. Carley, David W., et al. "Functional role for cannabinoids in respiratory stability during sleep." Sleep 25.4 (2002): 391-398. Castillo, Pablo E., et al. 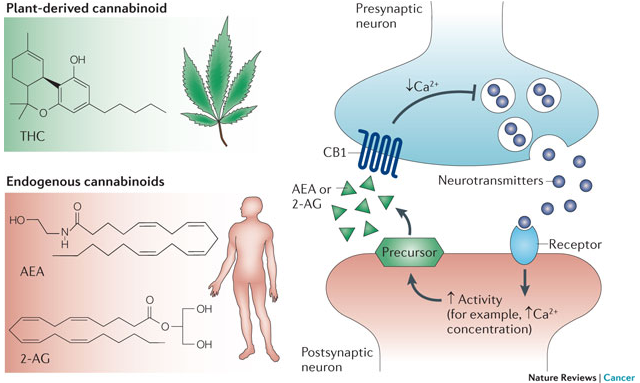 "Endocannabinoid signaling and synaptic function." Neuron 76.1 (2012): 70-81. Cencioni, Maria Teresa, et al. "Anandamide suppresses proliferation and cytokine release from primary human T-lymphocytes mainly via CB2 receptors." PLoS One 5.1 (2010): e8688. Chakrabarti, Bhismadev, and Simon Baron-Cohen. "Variation in the human Cannabinoid Receptor (CNR1) gene modulates gaze duration for happy faces." Molecular autism 2.1 (2011): 10. Di Filippo, Clara, et al. "Cannabinoid CB2 receptor activation reduces mouse myocardial ischemia-reperfusion injury: involvement of cytokine/chemokines and PMN." Journal of leukocyte biology 75.3 (2004): 453-459. Di Marzo, V., and F. Piscitelli. "Gut feelings about the endocannabinoid system." Neurogastroenterology & Motility 23.5 (2011): 391-398. Fernández‐Ruiz, Javier, et al. "Prospects for cannabinoid therapies in basal ganglia disorders." British journal of pharmacology 163.7 (2011): 1365-1378. Földy, Csaba, Robert C. Malenka, and Thomas C. Südhof. "Autism-associated neuroligin-3 mutations commonly disrupt tonic endocannabinoid signaling." Neuron 78.3 (2013): 498-509. Gamage, Thomas F., and Aron H. Lichtman. "The endocannabinoid system: role in energy regulation." Pediatric blood & cancer 58.1 (2012): 144-148. Garcia, Arnau Busquets, et al. “New insights into the molecular pathophysiology of fragile X syndrome and therapeutic perspectives from the animal model”, International Journal of Biochemistry and Cell Biology, 53 (2014) 121-126. Godlewski, Grzegorz, Manfred Göthert, and Barbara Malinowska. "Cannabinoid receptor‐independent inhibition by cannabinoid agonists of the peripheral 5‐HT3 receptor‐mediated von Bezold–Jarisch reflex." British journal of pharmacology 138.5 (2003): 767-774. Gomes, Felipe V., Leonardo BM Resstel, and Francisco S. Guimarães. "The anxiolytic-like effects of cannabidiol injected into the bed nucleus of the stria terminalis are mediated by 5-HT1A receptors." Psychopharmacology 213.2-3 (2011): 465-473. Gong, Jian-Ping, et al. "Cannabinoid CB2 receptors: immunohistochemical localization in rat brain." Brain research 1071.1 (2006): 10-23. Haj-Dahmane, Samir, and Roh-Yu Shen. "Modulation of the serotonin system by endocannabinoid signaling." Neuropharmacology 61.3 (2011): 414-420. Iring, András, et al. "Role of Endocannabinoids and Cannabinoid-1 Receptors in Cerebrocortical Blood Flow Regulation." PloS one 8.1 (2013): e53390. Jean-Gilles, Lucie, Bruno Gran, and Cris S. Constantinescu. "Interaction between cytokines, cannabinoids and the nervous system." Immunobiology 215.8 (2010): 606-610. Jiang, Chengyu, Adrian T. Ting, and Brian Seed. "PPAR-γ agonists inhibit production of monocyte inflammatory cytokines." Nature 391.6662 (1998): 8286. Johnson, Jeremy R., et al. "Multicenter, double-blind, randomized, placebocontrolled, parallel-group study of the efficacy, safety, and tolerability of THC: CBD extract and THC extract in patients with intractable cancer-related pain." Journal of pain and symptom management 39.2 (2010): 167-179. Juknat, Ana, et al. "Cannabidiol affects the expression of genes involved in zinc homeostasis in BV-2 microglial cells." Neurochemistry international 61.6 (2012): 923-930. Jung, Kwang-Mook, et al. "Uncoupling of the endocannabinoid signalling complex in a mouse model of fragile X syndrome." Nature communications 3 (2012): 1080. Katona, István, and Tamás F. Freund. "Multiple functions of endocannabinoid signaling in the brain." Annual review of neuroscience 35 (2012): 529-558. Kawamura, Yoshinobu, et al. "The CB1 cannabinoid receptor is the major cannabinoid receptor at excitatory presynaptic sites in the hippocampus and cerebellum." The Journal of neuroscience 26.11 (2006): 2991-3001. Kerr, D. M., et al. "Alterations in the endocannabinoid system in the rat valproic acid model of autism." Behavioural brain research 249 (2013): 124-132. Kishimoto, Yasushi, and Masanobu Kano. "Endogenous cannabinoid signaling through the CB1 receptor is essential for cerebellum-dependent discrete motor learning." The Journal of neuroscience 26.34 (2006): 8829-8837. Klegeris, Andis, Christopher J. Bissonnette, and Patrick L. McGeer. "Reduction of human monocytic cell neurotoxicity and cytokine secretion by ligands of the cannabinoid‐type CB2 receptor." British journal of pharmacology 139.4 (2003): 775-786. Kozela, Ewa, et al. "Cannabinoids ∆9-tetrahydrocannabinol and cannabidiol differentially inhibit the lipopolysaccharide-activated NF-κB and interferonβ/STAT proinflammatory pathways in BV-2 microglial cells." Journal of biological chemistry 285.3 (2010): 1616-1626. Li, Chen, Peter M. Jones, and Shanta J. Persaud. "Role of the endocannabinoid system in food intake, energy homeostasis and regulation of the endocrine pancreas." Pharmacology & therapeutics 129.3 (2011): 307-320. Machado Bergamaschi, Mateus, et al. "Safety and side effects of cannabidiol, a Cannabis sativa constituent." Current drug safety 6.4 (2011): 237-249. Malcher-Lopes, Renato. "Targeting alterations in the endocannabinoid system of rodents and non-human primates for the study of autism." Qatar Foundation Annual Research Conference. No. 2013. 2013. Marco, Eva M., et al. "Endocannabinoid system and psychiatry: in search of a neurobiological basis for detrimental and potential therapeutic effects." Frontiers in behavioral neuroscience 5 (2011). Mato, Susana, et al. "CB1 knockout mice display impaired functionality of 5‐HT1A and 5‐HT2A/C receptors." Journal of neurochemistry 103.5 (2007): 2111-2120. Mikics, Eva, et al. "Interactions between the anxiogenic effects of CB1 gene disruption and 5-HT3 neurotransmission." Behavioural pharmacology 20.3 (2009): 265-272. Müller‐Vahl, K. R., et al. "Cannabinoids: possible role in patho‐physiology and therapy of Gilles de la Tourette syndrome." Acta Psychiatrica Scandinavica 98.6 (1998): 502-506. Napolioni, Valerio, et al. "Plasma cytokine profiling in sibling pairs discordant for autism spectrum disorder." Journal of neuroinflammation 10.1 (2013): 38. Pacher, Pál, Sándor Bátkai, and George Kunos. "The endocannabinoid system as an emerging target of pharmacotherapy." Pharmacological reviews 58.3 (2006): 389-462. Palazuelos, Javier, et al. "CB2 cannabinoid receptors promote neural progenitor cell proliferation via mTORC1 signaling." Journal of Biological Chemistry 287.2 (2012): 1198-1209. Panikashvili, David, et al. "The endocannabinoid 2-AG protects the blood–brain barrier after closed head injury and inhibits mRNA expression of proinflammatory cytokines." Neurobiology of disease 22.2 (2006): 257-264. Pomerantz, Daniel J. "THE ROLE OF CB2 ENDOCANNABINOID RECEPTOR AND MTORC1 IN NEUROPROGENITOR CELL PROLIFERATION IN TUBEROUS SCLEROSIS." Emphasis Program (2013): 73. Rock, Erin. Cannabidiol Indirectly Activates 5-HT1A Somatodendritic Autoreceptors to Attenuate Vomiting and Nausea. Diss. 2011. Roloff, Alan M., et al. "Homer 1a gates the induction mechanism for endocannabinoid-mediated synaptic plasticity." The Journal of Neuroscience 30.8 (2010): 3072-3081. Siniscalco, Dario, et al. "Cannabinoid receptor type 2, but not type 1, is upregulated in peripheral blood mononuclear cells of children affected by autistic disorders." Journal of autism and developmental disorders 43.11 (2013): 26862695. Sharkey, Keith A., Nissar A. Darmani, and Linda A. Parker. "Regulation of nausea and vomiting by cannabinoids and the endocannabinoid system." European journal of pharmacology 722 (2014): 134-146. Tanimura, Asami, et al. "Not glutamate but endocannabinoids mediate retrograde suppression of cerebellar parallel fiber to Purkinje cell synaptic transmission in young adult rodents." Neuropharmacology 57.2 (2009): 157-163. Vaney, C., et al. "Efficacy, safety and tolerability of an orally administered cannabis extract in the treatment of spasticity in patients with multiple sclerosis: a randomized, double-blind, placebo-controlled, crossover study." Multiple Sclerosis 10.4 (2004): 417-424. Zhang, Jun-Ming, and Jianxiong An., et al. “Cytokines, Inflammation and Pain.” International anesthesiology clinics2 (2007): 27–37. PMC. Web. 11 June 2015.